If you decide to have Amalfi as your base camp, I would recommend taking the boats to and from other towns, such as Capri, Positano, and Sorrento. The boat rides are absolutely lovely, and short in duration, most less than 1/2 hour. Buses are an inexpensive option as well. We took a bus to Poggerola early one morning, and then hiked back down to the beach. It took about an hour, but the views of the olive groves and the surrounding towns were stunning. If you do stay in Amalfi, do not miss Ravello. It is high on the hill, and easily reached by bus. The bus is an experience in itself, with the switchbacks! It is amazing how the drivers manage to maneuver those turns. You can buy bus passes at the Tabacchi shops which are good for the day. Do not bother with taxis, they will cost you a fortune, and you won't get to experience Italy in my opinion. The evening passagiata is an experience not to be missed. Everyone in the town comes out for a stroll, a cafe, gelato or conversation. Dinner is late, so prepare yourself. I personally do not like to be the only diner, so be ready to eat around 9 or 10 when the trattorias come alive. The Hotel Marina Rivera overlooks the sea with panoramic views of the town. It has a great outdoor terrace where they serve breakfast (included) each day. 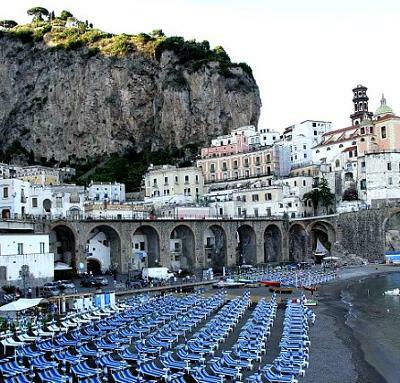 Everything in Amalfi is within walking distance. I particularly loved this hotel because we had a sea view with an outdoor terrace. Maria's reply: Thank you very much for sharing these great tips. I really do appreciate it and I'm sure other visitors to the site do too.